Thursday Night = Bike Night with Faded Jeans! | Faded Jeans – Arizona's Party Band! ← Faded Jeans T-Shirts are here – just in time for your FJB weekend! Thursday Night = Bike Night with Faded Jeans! Ladies, gentlemen, and FJB fans of all ages: get revved up for Faded Jeans this Thursday evening! You don’t need a motorcycle to get in on the fun, so we want to see all of you there! For more info on the event, check out www.cyclerides.com. And, don’t forget to show off your new Faded Jeans T-shirt! Don’t have one yet? Grab one at the show for only $20! Here’s an add to share and help promote the big night! P.S. As always, keep up with Faded Jeans on Facebook … and Twitter … thanks! One Response to Thursday Night = Bike Night with Faded Jeans! 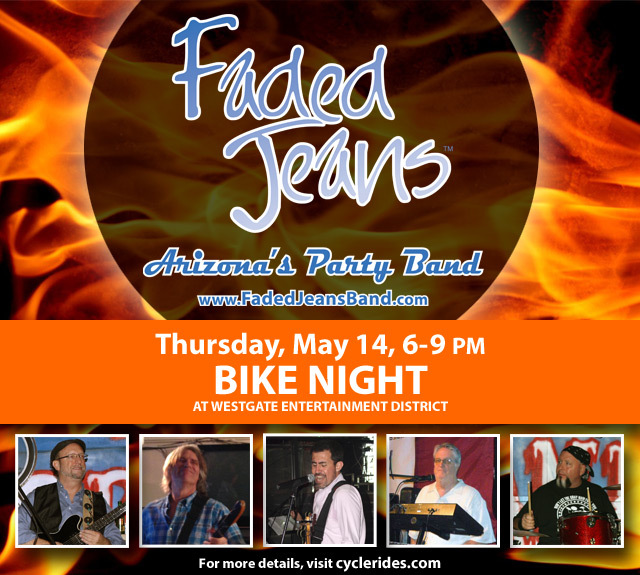 From:”Faded Jeans – Arizona’s Party Band!” Date:Mon, May 11, 2015 at 10:14 am Subject:[New post] Thursday Night = Bike Night with Faded Jeans!